This literature review examines current learning trends in the corporate training environment which includes a gradual decrease in the use of instructor led training accompanied by a corresponding rise in the use of e-learning (self-paced, web based, computer controlled instruction) and blended learning (a combination of e-learning and instructor led training). In the first section I define corporate training and examine the current trends in corporate training topic areas and learning delivery modes. I then provide an examination of the advantages and disadvantages of the delivery mode that is my chosen area of interest: e-learning. Finally, I explore if blending e-learning with instructor led training can overcome e-learning disadvantages. Learning within a corporate context refers to a process by which employers develop skills and acquire knowledge to improve their workplace performance (Rosenberg, 2001). Unlike education, where generalized instruction might encourage inquiry into multiple approaches, workplace training is more likely to involve teaching a learner a very specific skill, such as how to operate a piece of machinery, or how to prepare a certain food (Sleight, 1993). With the utilitarian focus of corporate training, one could assume that formal learning content in companies tend to cluster into a group of knowledge, skills, and behaviors needed by workers to execute the smooth operation of the enterprise as well as to achieve a maximization of profit. For example, one factor involved in profit maximization for many firms is the increase of sales revenue. One way to increase sales revenue is to train employees on how to perform behaviors that lead to sales revenue gains. Since increasing sales is important, we can assume that the topic of sales is a common subject area for corporate training. Annual industry surveys conducted in 2003 and 2011 by the American Society of Training and Development corroborates this assumption by showing that, in both years, sales was one of the top ten most common content areas trained. (Miller, 2012). 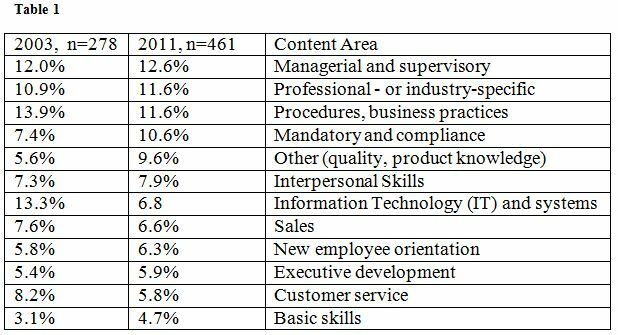 Since workplace learning is tightly focused on worker performance, it is no surprise that the highest percentage of content in formal corporate training in 2011 was allocated to the area of managing and supervising. Managers and supervisors are tasked with optimizing employee performance. It is also no surprise that the topic categories remained fairly stable over a period of nine years. Table 1 does show some large changes in the training content mix from 2003 to 2011. Two examples are the reduction in IT and systems training and the increase in mandatory and compliance training. However, the causes of these changes were not examined and remain unclear. Adding to the uncertainty is the difference in sample size (278 in 2003 versus 461 in 2011). This increased sample size could have resulted in a different mix of industries from one year to the next which could correlate with a different mixture of content areas examined. Companies in the manufacturing sector, for example, focus fewer training resources on customer service than companies in the retail sector (Miller, 2012). A heavier weighting of manufacturers in 2011 could have made a proportional decrease in the percentage of programs and classes devoted to customer service. We can, however, conclude that no radical changes in the content areas occurred in the nine year difference of the data presented in Table 1. Starting in the late 1990’s, the availability of the Internet and intranet networks sparked a rapid adoption of e-learning within corporations. E-learning is defined as “the use of computer network technology, primarily over an intranet or through the Internet, to deliver information and instruction to individuals” (Welsh, Wanberg, Brown, & Simmering, 2003, p.246). E-learning exists in many forms: self-paced, web based, computer controlled instruction; live webcasts; video and voice over IP; online resource links; video and audio casts; online self-assessments; email; e-books and e-docs; list servers; and online communities. The term e-learning, within the context of this paper, is limited to self-paced, web based, computer controlled instruction. During the initial deployment of e-learning at the turn of the century, some large corporations were reporting large savings. International Business Machines, for example, claimed a savings of US $200 million in 1999 by replacing instructor led learning with e-learning. Similarly, Ernst and Young reduced their training budget by 35%, (Strother, 2002). Although the upfront costs for media rich, interactive self-guided training may be several times that of paper based training material used in a classroom, that cost is nonrecurring. The resulting course can then be re-used with low recurring costs. (Welsh, et al., 2003) Although cost reduction may have been an early motivator for some companies, Bersin (2004) notes that e-learning may not reduce costs but shift costs from “variable (instructor salaries and travel) to fixed (infrastructure, content development, and technology upgrades)” (p. 20). Equally - if not more - important to many corporations are the e-learning advantages of consistency and worldwide training. For example, e-learning’s ability to instruct compliance topics with exacting consistency to tens of thousands of learners from London to Los Angeles to Beijing is quite valuable (Kapp & McKeague, 2002). The incentives are clear for corporations deploying e-learning as a substitute for live classroom instruction, but what is the perspective of the learner regarding this shift? For the student, is self-paced e-learning as effective as or more effective than classroom instruction in changing behavior? Representatives from Unilever claim that e-learning resulted in changes in learner behavior that created an increase of US $20 million in sales performance from their sales staff (Strother, 2002). Clark and Mayer (2011) maintain that studies indicated no significant difference in learning performance between e-learning and classroom instruction. Two meta-analyses studies support Clark’s theory (Sitzmann, Kraiger, Stewart, & Wisher, 2006; Means, Toyama, Murphy, Bakia, & Jones, 2010). Since e-learning offers significant advantages for corporations with no degradation in learning transfer, one would expect to see an almost total abandonment of instructor led classroom training. However in 2010, more than a decade after the rush to e-learning, the majority of formal learning (59.1%) still occurs with instructor led classes - albeit this percentage is steadily declining (Green, 2011). The persistence of instructor led training implies that e-learning may have limitations or disadvantages which do not exist in the instructor led classroom setting. Mungania (2003) described seven e-learning disadvantages that are barriers in the workplace: personal learning style; differences in the way people approach learning; instructional; organizational; situational; content suitability; and technological. An employee who goes to a classroom or training lab to learn usually won’t be interrupted for routine matters… But employees who learn at their desktops often face constant distractions (p. 59). Mungania (2003) described four key predictors of barriers to developing an e-learning program: organizational; self-efficacy; computer competence; and computer training. The first predictor, organizational issues, can signify how the company structures the e-learning, specifically if they create available time for employees to complete e-learning. Instructor led training does not suffer from this same barrier. Learners must remove themselves from work tasks so that they can attend instructor led classes. Bandura (1977) defined self-efficacy as “the conviction that one can successfully execute the behavior required to produce the outcomes” (p. 79). Computer competence was the skill at using technology and computer training referred to the quality of the training. Mungania (2003) noted how computer competence and self-efficacy was inversely correlated with e-learning dropout rates - the lower an employee’s self-efficacy or computer competence, the higher the dropout rate. With classroom instruction, teachers can help students develop self-efficacy by encouraging learners with comments regarding the learner’s possession of certain capabilities or in developing skill in their performance (Siegle & McCoach, 2007). This type of personalized human exhortation is very difficult to offer through self-paced, computer controlled e-learning. E-learning provides consistency of delivery and other powerful advantages to corporations and presents similar learning outcomes to classroom training. However, barriers to completing e-learning can result in high dropout rates or minimal learning. High e-learning drop-out rates can be reduced with the use of a blend of instructor led classroom training and e-learning. With blended learning, corporations may benefit from the advantages of e-learning while reducing the drop-out rates to bring learning completion closer to what is found with instructor led training.